I am definitely dreaming of being back on the beach today as I sit here in fall Wisconsin temps. Since returning home from our recent vacation we have jumped directly into back-to-school prep for the boys. Just like that, summer is gone. But the week at the beach was everything we needed and more before we start our descent into the cold and busy months ahead. 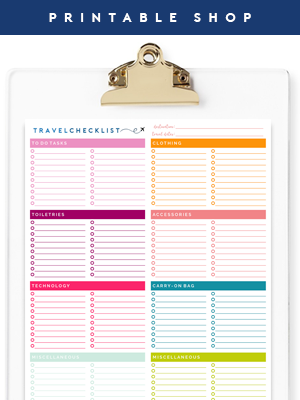 Earlier this week I shared some of our favorite tips for traveling on the road; everything from a fillable travel checklist to a cool cooler hack to a first aid kit and travel toys for the boys. 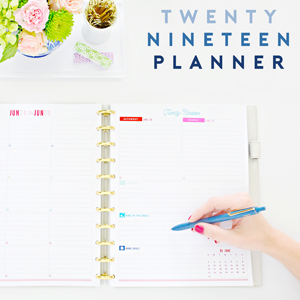 But how did we stay organized while we spent our days on the beach? 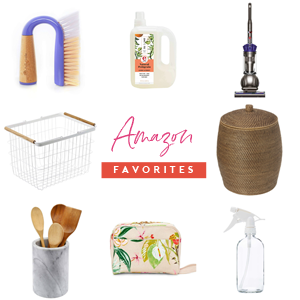 Well, it really wasn't anything earth shattering or mind blowing, but I did think it would still be fun to share a couple items we are beachy keen on and a couple little tips that added extra breeze to our sun and sand filled days. First, how cute is that beach bag? As many of you know, I became dear friends with Cassie of Hi Sugarplum through this blogging venture. 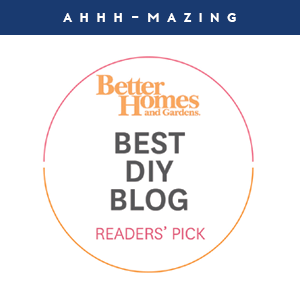 After we fell in love with the great state of Florida and its beautiful beaches, we encouraged Cassie's clan to join us in lounging by the aqua blue waters and exploring the quaint island of Anna Maria. That was three years ago and it has sort of turned into this amazing little tradition of getting our families together and forming really special bonds and memories. This year leading up to our trip I received a surprise delivery and inside was a darling tassel adorned beach bag. I love it and the special pal who sent it my way. The contents of the tote looked a little different every day, but there were a few things that I found to be really helpful. 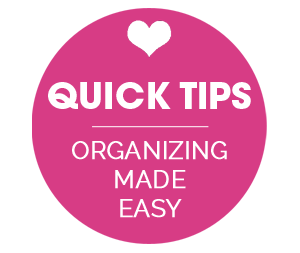 My biggest tip is to organize the interior of the bag with pouches! I know, you are completely shocked because I organize everything with pouches. But that is because they work! 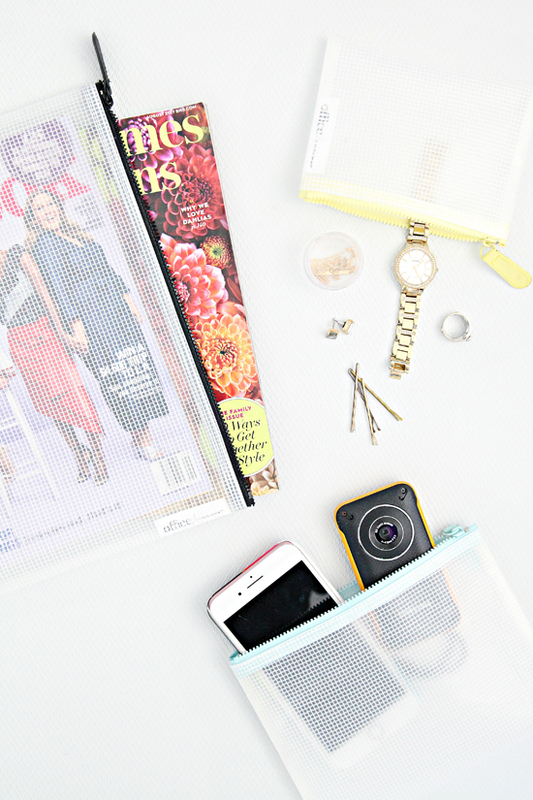 So yes to pouches and a double yes to pouches that are waterproof and easy-to-rinse/clean. The main pouch I utilized was a cosmetic case for holding all of my favorite beach friendly toiletries. SUNSCREEN // This is a no brainer. Sunfilled days need sunscreen covered bodies. LIP BALM // I find that my lips suffer from too much time in the sun so I picked up some SPF lip balm and not only does it protect, but it comes in some really great scents! LEAVE IN CONDITIONER // The ocean creates some crazy hair, so I filled a travel size spray bottle with leave-in-conditioner to begin the hair taming process. WET BRUSH // Condition first, then fight snarls with a brush made specifically for tangled messes. I would be in tears without this combination. 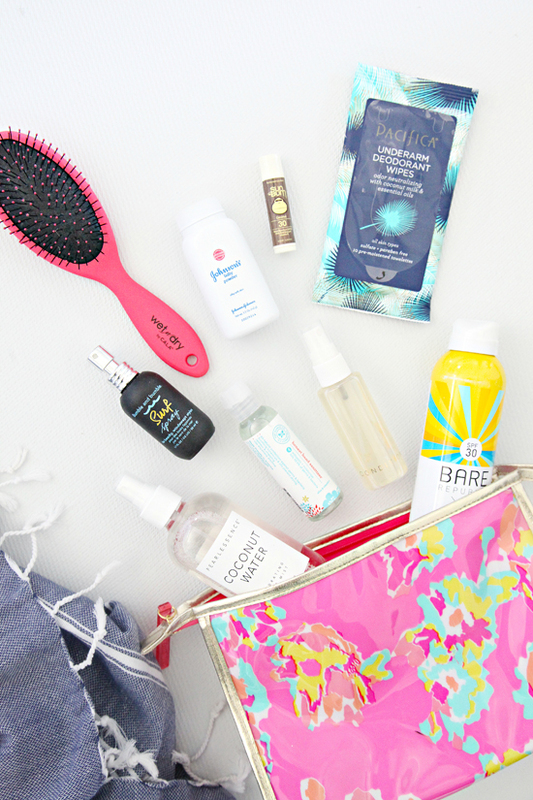 SURF SPRAY // If we plan to hang out for awhile after the beach, I like to add some surf spray to my hair which adds extra curl and tames the frizz. HAND SANITIZER // Because I am sort of a germaphobe. BABY POWDER // Easily helps to remove sticky sand from the body and hair. DEODORANT WIPES // I love these things! I am always nervous that my deodorant stick will melt in the heat, so these are a great alternative for feeling fresh after hours in the hot sun. COCONUT WATER FACE MIST // This happy surprise was a family favorite! Not only was it a wonderful way to hydrate our skin, but the smell was so invigorating. Anytime we felt hot, sweaty, sticky, or just plain yuck, this stuff made all of that go away and it dried almost instantly. This spray also came in quite handy during our 24-hour drives. The next set of pouches were used to protect valuables inside of the bag from water and sand. I used this Martha Stewart set from Staples and the various sizes couldn't have worked out better. MAGAZINES // The large size pouch fit a couple of magazines and/or books and protected the pages from becoming soggy and wrinkled. TECH // The medium size pouch held an underwater camera and our cell phones, keeping them free of sand. ACCESSORIES // The small size pouch was put to use holding my jewelry and hair accessories. I wasn't sure if I was over-spending for this next product, but having it for over a year now, I can say we find it to be worth every penny. 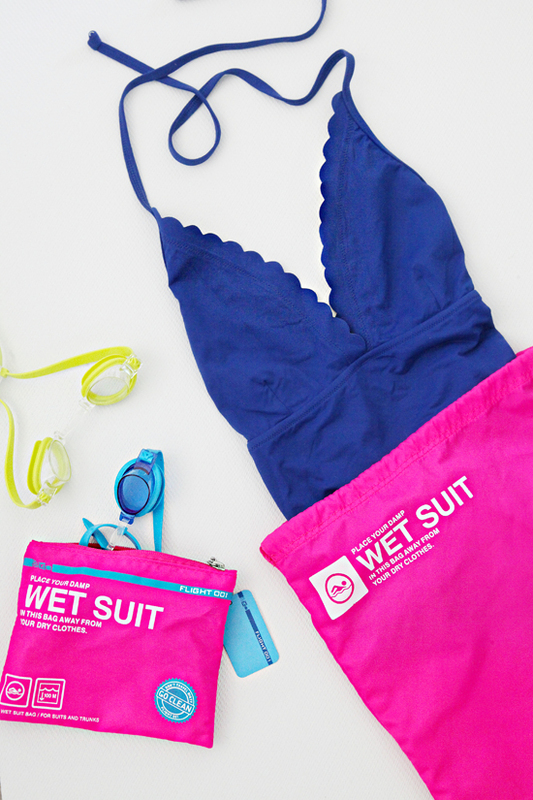 This large Wet Suit bag easily fits all five of our swimsuits and prevents everything else in the beach bag from getting damp. The set comes with a larger sack and a smaller zip pouch, which I typically utilize for goggles or sunglasses. Oh, and because I know I will get asked, this is the source for my swimsuit, and it is the softest, most comfortable suit I have ever owned. 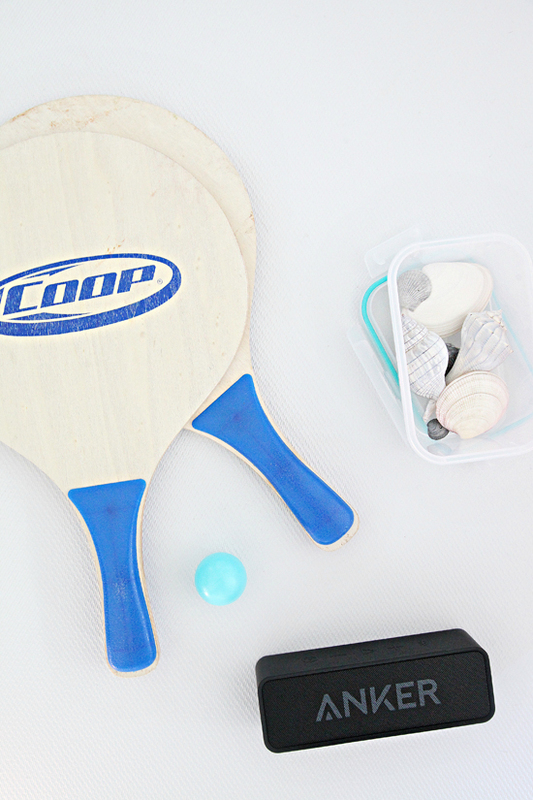 When the boys were younger we would bring an entire slotted bin to the beach filled with sand toys, but now that they are older they either play in the water, dive and search for seashells, play catch with a Nerf football or play with paddles in the sand. So, I like to toss a hard-sided, lidded container into the bag to hold their shells and prevent them from breaking. We also bring a net or mesh sack (not pictured), for the boys to use while searching for shells in the sea. We also pack a waterproof Bluetooth speaker and use to add a little extra fun or ambiance to the day. That said, we try to remain respectful to those around us and only play our tunes at low levels when others are near. 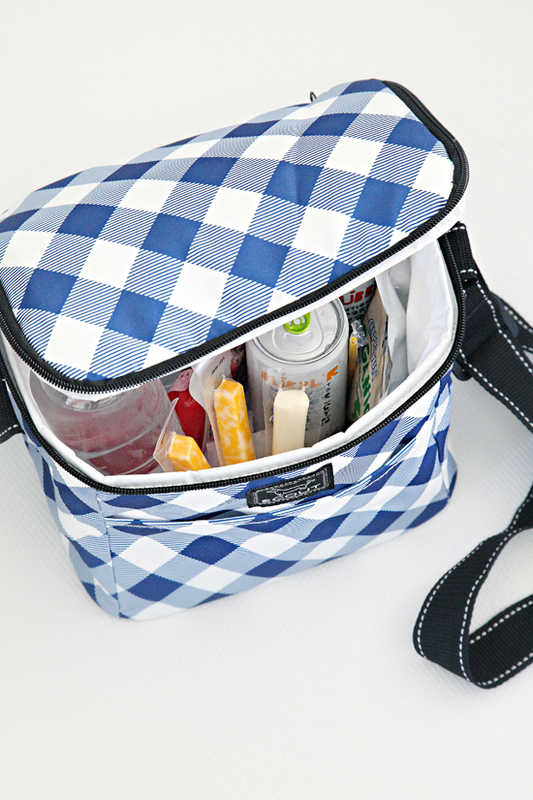 COLLAPSABLE COOLER // If we were only going to be on the beach for a few hours, this soft-sided cooler was ideal for holding a couple of waters and juices as well as a few small snacks. Some days we would pack up the larger cooler to leave in the car with full meal making supplies, and then just head up at lunch time and restock this smaller one for the remainder of the day (see how we pack our cooler here). It is a great size and also really easy to clean and it just folds down and stores inside of the beach-bag in-between uses. Last but not least, about halfway through the trip we realized we preferred using Turkish towels over regular beach towels. It was hot enough that we didn't need a heavy weighted towel to warm up, and the Turkish towels roll up nice and compact. The best part is that they don't trap or hold sand, so they are great for laying out and also double as a sarong. 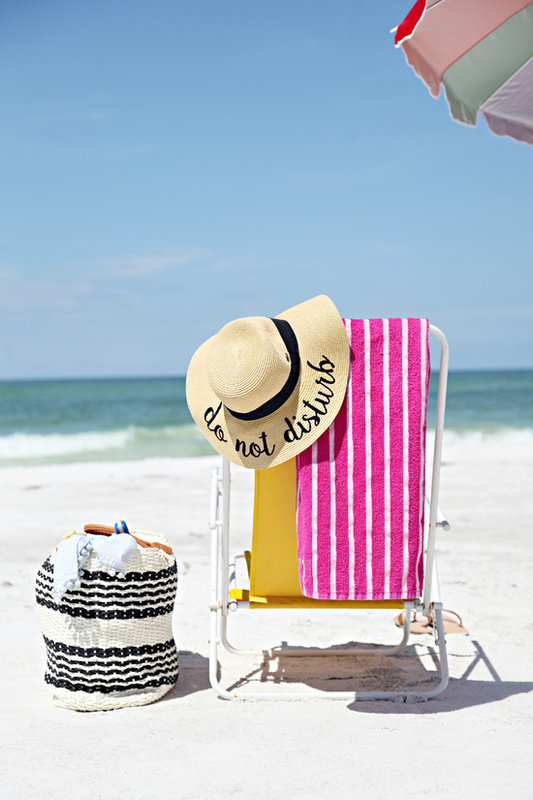 My in-laws keep their place stocked with lightweight folding beach chairs and a large umbrella, and they are really crucial for sun protection and comfort when spending that much time on the beach. I couldn't imagine our days without them, and the good news is that many beach towns have places that will rent those items out if you travel by plane. Of course, we also bring hats and sunglasses for the entire crew as well. It is inevitable that clothes and random items are tossed into the bag as it is rummaged through over the course of the day, so the pouches really are crucial in protecting items and keeping things somewhat manageable. So what am I missing? Do you have any products that are a must for the perfect sun, sand and sea day? 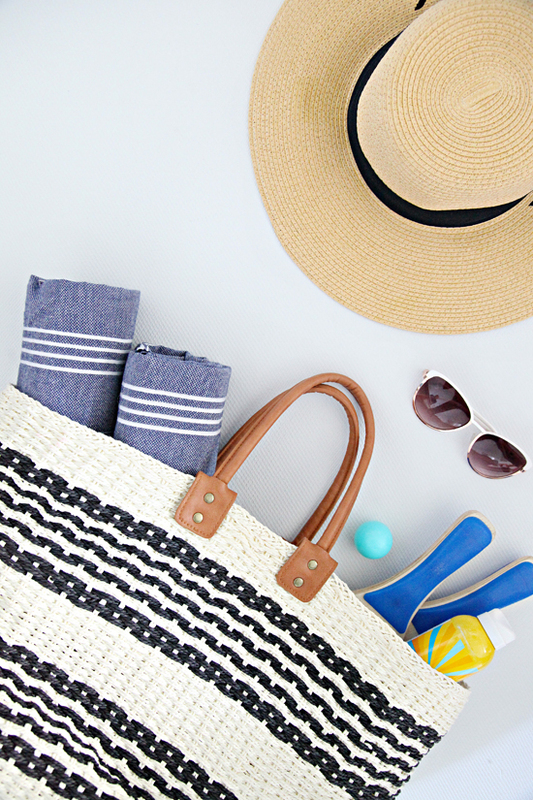 I would love to hear if there is anything we should add to our beach bag next year (which is much too far away). 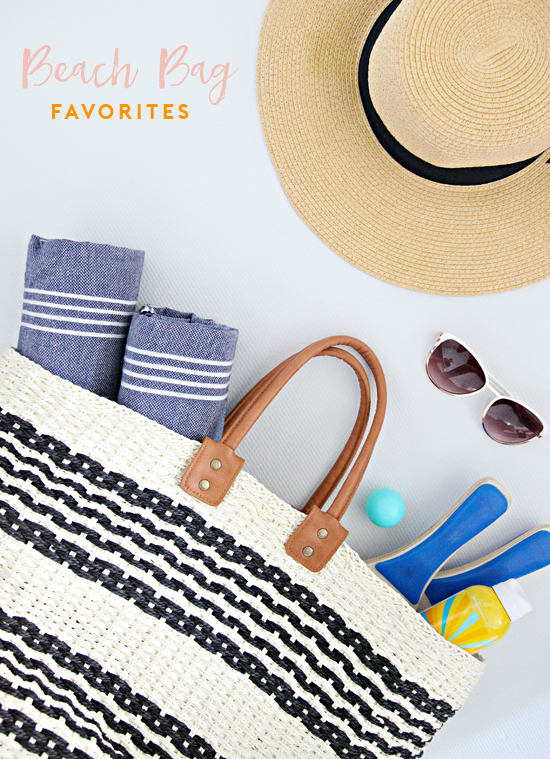 I really enjoyed reading this post and appreciate the thought you put into organizing all the goodies you need to enjoy a day at the beach. The Martha Stewart pockets for magazines, etc. are genius! I like to add headphones (in a small q-tip container) and a coverup that can look presentable if we decide to go to a restaurant after the beach. In Coronado, CA we head to the Hotel Coronado for drinks so it helps to not show up in my bathing suit! Thank you for all the tips and tricks. I paddle on an outrigger team, so I'm at the beach and in the ocean 3-4 times a week. I keep a plastic kitty litter container (cleaned out) full of warm water plus a large plastic bin for washing my feet and flip flops off after getting out of the ocean. Works like a charm and I never get sand in my car! I love that bag you showed, and I do like Fouta towels, but the real killer towel for me is a waffle weave bath sheet from my company, Gilden Tree. They're huge, but don't take a lot of space and sand just falls right off them. We are far from the ocean, but they're great for the lake, too. where did you get those cool sunglasses? Thank you Raquel. I found the sunglasses at a local clothing store, but I see they are also sold on Amazon: http://amzn.to/2wKga6P. xoxo!